Keema matar (English: "pea and minced meat") is a dish from the Indian subcontinent associated with the Mughals. 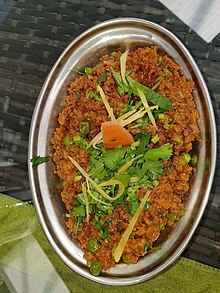 "Keema matar" was popularly eaten in the courts of Mughal India. In royal families of the Indian subcontinent, the dish was served at special occasions and events like weddings and celebrations etc. In Mughal families it was included in weekly menu. The dish was named as "Keema matar" but now in common language it is spoken as "Matar Qeema". Ingredients of this dish are already specified in its name i.e "Matar" (pea) and "Keema" (mince). Meats used include ground goat meat lamb or beef. All other ingredients include indian spices and water with banaspati ghee. ^ Narain, P. (2000). The Essential Delhi Cookbook. Penguin Books Limited. p. pt54. ISBN 978-93-5118-114-9. ^ Goor, R.; Goor, N. (1999). Eater's Choice Low-Fat Cookbook: Eat Your Way to Thinness and Good Health. Houghton Mifflin Company. p. 23. ISBN 978-0-395-97104-8.